Could asking questions about the women that came before you help you better understand your own motherhood journey? Genevieve Slonim believes so and is here to explain the role that ancestral women’s wisdom plays in pregnancy, birth and postpartum. 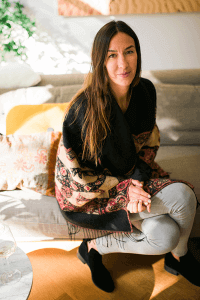 Genevieve is a mother of three, the founder of Birth Of A Mama, a Therapist, a Narrative Family Practitioner, a Childbirth Educator, and a Birth and Postpartum Doula. On today’s episode, Genevieve is speaking to us about identity, postpartum community care, and how your ancestor’s stories around birth and motherhood could hold great insights and lessons for you as you walk your own motherhood path. I am a therapist with an M.A. in Psychology and recently earned certification in Narrative Family Therapy. I am also a certified Birth and Postpartum Doula and Childbirth Educator. I have been deeply active in peace activism and social justice work for over 20 years. Most importantly to me I am a married mother of 3. After working with women in therapeutic settings for years, once I gave birth to my daughter I was caught off guard at how unprepared I felt to cope with early motherhood. I felt a deep longing for family support and community and it seemed as though something very important was missing. While I was still breastfeeding and on maternity leave I began taking a course as a birth doula. Along with all the incredible knowledge I gained about pregnancy, childbirth and the postpartum transition, the real wisdom was found within the healing that took place within our motherhood collective. My fellow doula students became my motherhood community as we shared family challenges, asked questions about our baby’s development and shared women’s wisdom traditions, remedies and practices. After supporting women as a birth and postpartum doula I recently completed a 3 year certification process in Narrative Family Therapy. My academic and professional training along with living within a matrilineal culture steeped in ancestral women’s wisdom, has provided me with the ability to guide women in early motherhood. My life’s calling is supporting women navigate motherhood by strengthening their matrilineal lineage, healing generational trauma, creating a supportive community and living a life of meaning and purpose.